Our Companion Collection has just welcomed its 30th member - Toy Poodle Pendant Necklace. And we think it deserves a special toast! Fashion comes and goes, but style stays. Especially when you add your personal touch, the individuality shines through and it becomes a part of you. Why not bringing your beloved fur kids closer to your heart in a classic yet versatile way? Celebrating the love bond and feeling the joy! Our Companion Collection was featured on Lucky.com. All the Companion Collection pieces can be custom made in solid gold, white, yellow or rose. This 14K gold Westie pendant necklace was sent all the way to Australia, a very sweet surprising gift, from him to her. Who says our pendants are just for the neckline? They are totally wrist candies too! Be creative and have some fun! Hello 2015, and hello, our first product of the year! Entering year 2015, we are so excited to introduce our very first product of the year to you - KADIN Ring from our brand new NEXUS Collection. Kadin ring is our very first ring design and it opens a new chapter for our brand. It is modern, chic, yet very versatile, either you are dressed up or down, it will never go wrong with our KADIN Ring! KADIN Ring will be available on 1.26.15 with three colors to choose from, silver, gold or black. For more product details, please visit our online store. We hope you will fall in love with KADIN, just like we all do. 10K fans, thank you, thank you! 2 Weeks ago, we have hit another milestone. Our official Mochi & Jolie Facebook page has reached 10K fans and it is all because of YOU! Thank you all so much for your love and support! We will carry your love in our hearts and always do our best! Happy 5th Anniversary to Mochi & Jolie! This month, Mochi & Jolie is celebrating its 5th year Anniversary. It has been a wild and super fun 5 years. From the moment we decided to take a leap of faith and chase our dreams, to all the great memories and friendly faces we treasure, ...this 5 years can never be replaced by anything else. Sure, there will be many obstacles along the way, but we believe with your love and support, we can conquer anything! If you have been with us for a long while, you might notice we are currently going through a major transition. The company is evolving, growing and maturing. We hope for whatever we do in the future, you will always be there cheering us on! So celebrating this milestone with us! And to show our appreciation for all of you, from today to the end of 3/16, when you shop at our online store, take 20% OFF on anything you buy! Please enter this special promo code: MOJO5YEARS. THANK YOU, THANK YOU and LOVE YOU ALL! Thank you for being a part of our past, present and future! Mochi & Jolie Jewelry Collection is coming! After 4 years of mochiandjolie.com's launch, we have decided it was about time to give our website a total new look. This time not only we wanted to change the whole look of the website to be more modern, clean and user friendly, but we also wanted to include our own online flagship store. After a very hard working period, it is finally here! We are very proud to present you the brand new www.mochiandjolie.com! After a long time's designing, planning, preparing, and many samples to work and approve on, the new brand MoMo™ is finally launched! It is officially launched on Mochi's birthday, 8-6-2012. MoMo™ is a brand we specially designed for all the dog lovers, like us. We want to create something not only unique but also practical, not only easy and fun, but also chic and fresh. We are taking our own spin on improving our daily life products. The first product line we are launching with the new brand is our MoMo™ Watch Collection. The first watch group has five fabulous designs: Maltese, Chihuahua, Dachshund, Frenchie and Labrador. The watches have clear faces and clear bands, not only it is easy to match any outfits, but it showcases the design to the best. A simple red MoMo™ logo is popping out on the watch face with a perfect finish. Such a simple and fun way to tell the time and tell the world how much you love your furry friend! 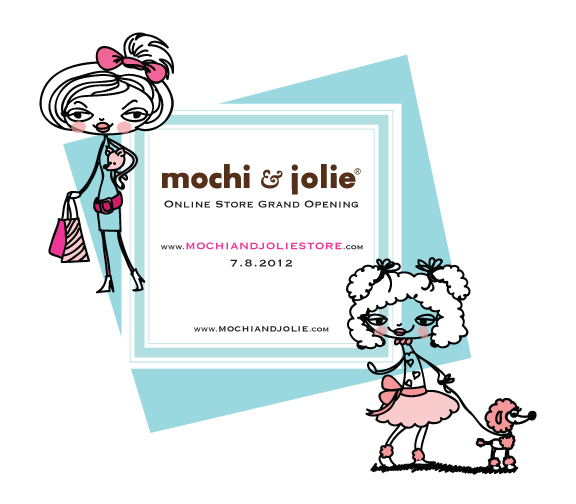 Mochi & Jolie Online Store Grand Opening! After many months' careful planning and designing, our own Mochi & Jolie Online Store is finally here! The grand opening is today - 7.8.2012! We are so excited!! Now not only we can offer all of our fabulous products directly to the customers, but also we can host some special and fun online events in the near future. The possibilities are endless! Click for the press release of our brand new label -- JoJo. We are very excited to introduce -- "JoJo", Mochi & Jolie's brand new label. It has a more casual chic and urban street wear style. JoJo's first resort line -- "JoJo's Best Friends" will be introduced this Summer. Vibrant colors, light weight 100% cotton, nothing over the top, but pure comfort and easy chic -- they are everything you and your beloved fur babies want for this summer. Stay tuned for the updates.